Bicyclists have similar rights and responsibilities as operators of motor vehicles, according to Massachusetts State Law. This means bicyclists must follow all traffic rules, and they are allowed to bike on any road in the state, except for limited access highways like I-93. Following the same rules as other vehicles makes you predictable and reduces the likelihood of a crash. Obeying the law also signifies respect to all road users, emphasizing the fact that bikes belong on our streets. It is important to practice defensive bicycling. Because bicycles are small, can easily filter through slow or stopped traffic, or can be obscured from view by cars, drivers and pedestrians will often not see bicycles or will forget to look for them. 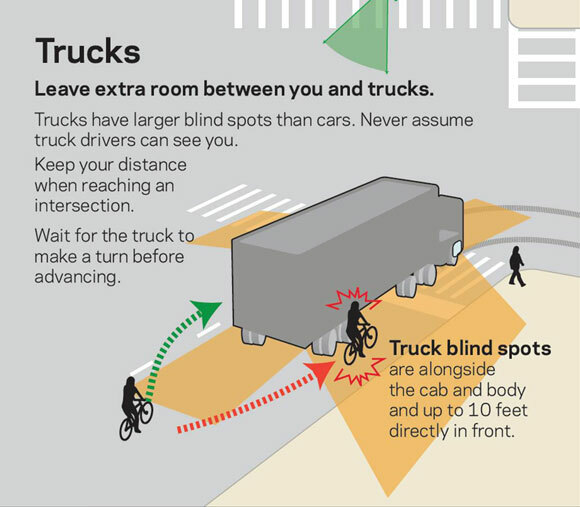 However, there are things you can do as a bicyclist to ensure that even when other people don't see you, a crash does not result. Below are resources for learning about safe bicycling practices as well as places where you can go to attend classes on urban bicycling. A must read for all riders about how to ride in any setting. A panel event held in 2016 in Somerville. This video was produced by the Boston Police Academy and MassBike for training police officers on Massachusetts bike laws, but it is also a great overview for everyone of how motorists, bicyclists, and pedestrians are expected to safely co-exist and share our streets. A Somerville-based business with classes for adults and children who do not know how to ride a bike, as well as classes for safe on-road riding. The City of Cambridge is proud to offer bicycle education workshops throughout the year, free to those who work or live in Cambridge. All classes are lecture-style workshops unless otherwise noted. To register for classes, please email jlawrence@cambridgema.gov or call 617/349-4671. All classes are paid for by the City of Cambridge and every participant receives one free helmet each year. Stop behind the stop line so as not to block pedestrians in crosswalks. Bike riding on sidewalks is prohibited in business districts. Bikes are required by law to have a front white light, rear red light/reflector, and side and pedal/ankle reflectors at night. Stop for all pedestrians in crosswalks. Do not pass other vehicles stopped at crosswalks -- there may be a pedestrian crossing in front of them. Always look behind you to see if it is clear before turning or changing lanes. If a lane is too narrow for sharing with a car, move into the center of the lane. Motorists are then less likely to pass unsafely. Turn left as a vehicle by merging into the left turn lane or left side of single lane. Or dismount and cross as a pedestrian using crosswalks. Avoid passing any moving vehicle on the right. Pass traffic slowly and carefully (including when there are bike lanes) and watch for turning vehicles. Beware of the door zone! Try to ride at least 4 feet away from parked cars, even if there is a narrow bike lane or if traffic is passing you. Ride in a straight, predictable line. Car drivers may not be able to avoid you if you suddenly move into their path. Bus passengers exit on the right, so always pass a stopped or stopping bus on the left; or wait behind until it starts moving again.